Why is it important to check your gutters before spring? In the Pacific Northwest, we get heavy warm rains during the spring months up until as late as July. Although this year, has been a anomaly, we usually see heavy rains even past the 4th of July. It is important to check your gutter system for potential or existing leaks, debris, clogs and proper downspout drainage. After the fall and into winter, any debris or clogs left in the gutter system has hardened, dried and rotted. It has also likely trapped moisture and water between it and the gutter material itself. If you have anything other than PVC (plastic) or aluminum as your gutters—you are susceptible to potential cracks, pin hole leaks and rust. 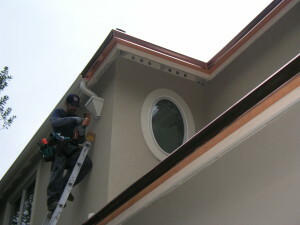 A quick inspection can give you an idea on whether or not you can repair the gutter system so that it can last through another winter; however, consider giving our gutter installation company a call for a free estimate to see what your options are and how we can quickly install a new cost effective system for you. You may be surprised that the industry estimates the cost for repair versus new installation is about a 60% difference. A repair may only last through one winter, while a new installation well maintained can last a life-time with the quality materials used today in continuous and seamless gutter installations.